Nothing says "I've resigned myself to all the dreary bits of adulthood; never again will I gurgle with childish joy at some delightful sight in nature; there is no such thing as magic" quite as clearly as the decision to make oneself a LinkedIn. Making a LinkedIn is a sad first step towards identifying oneself as a "young professional"; making a LinkedIn means realizing that you are never going to be a pop star or a very famous actor or, at the very least, someone who wears fashion culottes and lives in a very nice apartment despite never seeming to be employed. And now, the company's taken a step to limit the tender glimmer of childhood even more: they're opening LinkedIn to 14-year-olds in America and 13-year-olds in the rest of the world. I’m delighted to announce the launch of University Pages on LinkedIn — one cornerstone of our strategy to help students at every critical milestone from campus to fulfilling, successful careers. University Pages will allow students to Internet-stalk universities in an attempt to glean which will lead to the most fulfilling future. 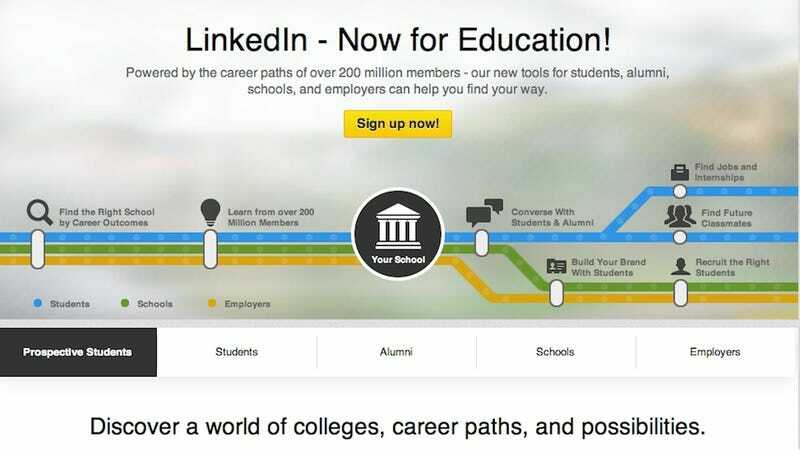 A few suggestions offered on the blog: check out universities online ("then, explore the careers of graduates to see which schools will get you to your goal")! Build your network! Explore the careers of philosophy or physics graduates ("you might be surprised at the diverse professional paths they’ve taken")! While it's nice to equip young children with the proper tools for forging their own futures — and tweens are very good at Internet-stalking, so this is pretty user-friendly — the idea of a 14-year-old networking with a variety of adults who have followed "diverse professional paths" makes me want to set up a shrine to the lost Spirit of Youth. Upon it, I will place a lanyard, a Frisbee, and like 12 troll dolls. RIP adolescence. I miss when the only thing laying siege upon you was sexting.